I nearly didn’t go into the fourth room, because my art sense had said it was French Impressionism, and I was all about the Munch. But perhaps I had a little spare time, or I’d circumnavigated the rest of the floor (in proper chronological order) because I did get into that room and realised it was early Munch. He’d been born in the Ådalsbruk in Løten, in 1863 and became a painter against the wishes of his father. After dropping out of technical college where he was studying engineering, he enrolled in 1881 at the Royal School of Art and Design of Kristiania (Oslo), where his teachers included the naturalistic Christian Krohg. Munch was trained in a naturalistic style, but he also explored Impressionism. This looking to France was a break from the Dahl tradition of German romanticism, and Munch was to exhibit in 1889 at the Exposition Universell. He also got to see work by Paul Gauguin, Vincent van Gogh, and Henri de Toulouse-Lautrec, discovering the use of colour to be emotional rather than realist. 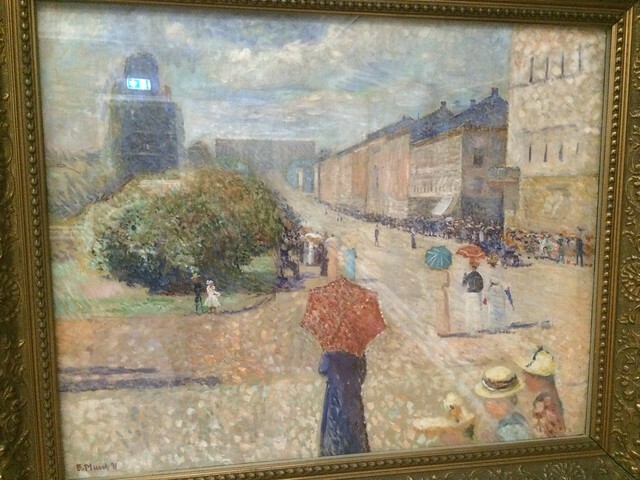 This explains the style of what felt a very un-Munch-like painting, Spring Day on Karl Johan (1890), which looks pontillist in style. Karl Johans Gate is a street in Oslo, named for King Charles III John (1763-1844), linking the Royal Palace to Oslo Station. My best guess is the painting is opposite the Grand Hotel, looking down to the palace, just before the Rosenkrantz’ Gate junction. The figures belong in a Seurat painting, with umbrellas and straw hats, with various figures perambulating towards the trees in the open space. Figures are about to walk into the frame, suggesting a kineticism. The shadows are quite long, note, with the sun to the south west. Note how blotchy the street is, with sandy colours picked out. In the top half of the canvas, with the grass and the buildings, there are far more people, a mass of pedestrians. It is a busy scene, perhaps vital, and you can make out the parasols and hats. I knew the name Karl Johan, though and returned to the previous (actually next) room, which contains the Frieze of Life paintings. There, as I thought, alongside Melancholy and Jealousy, was Evening on Karl Johan (1892). This is more clearly Munchian. The figures are not quite as stylised as his screamer, but there is a cartoon, skull beneath the skin, look to them. The men have top hats and the women straw trilbies, with black ribbons. But, to be honest, there’s a lack of differentiation between the faces. Whereas in the earlier painting, the clothing is in a variety of colours, now everyone is in black. The perspective is reversed — we are looking in the opposite direction, closer to the palace, and on the opposite side of the road. We are in the midst of the shoppers or flaneurs — these could almost be the undead that Eliot speaks of thirty years later in The Waste Land. The vanishing point is lower — more or less the centre of the canvas. Jay A. Clarke writes: “this new technique, along with the intense colors and inventive subject, mark a decisive turn away from his impressionist experiments and toward a world — and a modern mythology — all his own.” (56) Munch goes from Impressionist to Expressionist. He has become Munch. 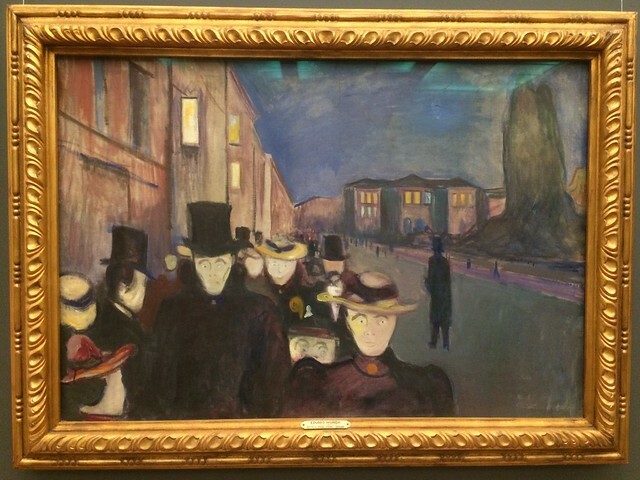 (Clarke also suggests that Munch had seen the work of James Ensor in Brussels the previous year, and that makes sense. 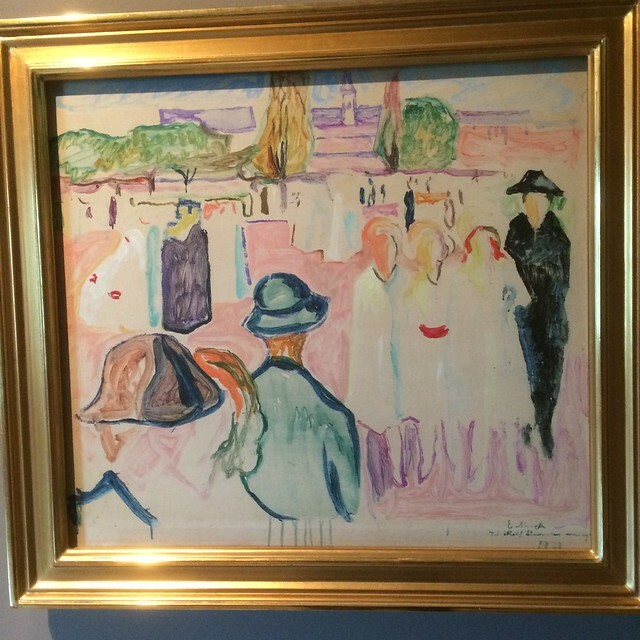 I hadn’t realised then that there was a third painting in Bergen — not just in another room, but in another building, KODE Four, as part of the International Modernism wing. This is Summer on Karl Johan Street, Oslo (1933). That forty year gap is misleading — the painting is in a style (Fauvism, maybe?) that Munch had been using since 1908. It’s a much more spare painting, with much of the canvas blank paint. It is harder to pin down the geography — is it the grass area? — and we don’t have the perspective of the earlier pictures. The street is pink and orange, with much canvas visible , almost painted around the figures, which are painted in, quickly I suspect, largely as outlines. There are much fewer figures, and some of them merge into each other, as depth becomes a plane. I think we only have women here, but a milliner would need consulting. Figures further away are little more iCal brush strokes. The trees are authentic green, if childlike, whereas the buildings (maybe the palace?) are pink and purple. I’m not sure what to make of this picture — it is less nightmarish than Evening on Karl Johan, but there’s a sense of the uncanny about it, because you have to decode it more. The colours are more cheerful, but there’s an air of mystery here. Clarke, Jay A. (2009) Becoming Edvard Munch: influence, anxiety, and myth, New Haven, CT: Yale University Press.